A warm breeze running through the bride’s hair. Soft sand beneath everyone’s toes. The bright light of the sun and the deep blue water with gently lapping waves. Picture-perfect beach weddings are desired by many couples, and it’s easy to see why. Destination weddings are becoming more and more popular. This week, we’re here with some of the best choices for beach weddings. Mexico is the top spot for beach weddings in the world. For people who want to have a beautiful wedding on the beach with friends and family in attendance, it’s actually one of the less expensive options. 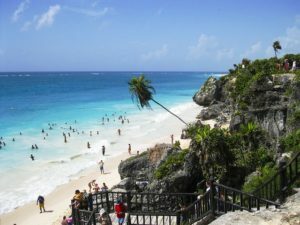 Cabo San Lucas in the west, or Cancun and Riviera Maya in the east, are most popular. Luxurious all-inclusive resorts, gorgeous views of the ocean, a vibrant nightlife, and great historical sight-seeing are just some of the reasons Mexico is a fun, great wedding spot. Jamaica is just slightly less popular than Mexico as a wedding destination. Its gorgeous white sand beaches and crystal clear ocean waters make it a picturesque place to hold your nuptials. Some of the most popular places are Negril and Montego Bay. Ochos Rios has amazing waterfalls, and Runaway Bay has cool caves. The year-round warm weather makes it a great getaway for a marriage anytime of the year, especially during the winter. Hawaii is a great choice! 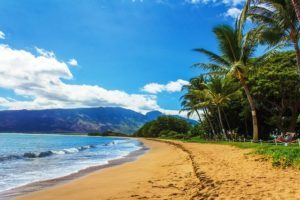 There are so many Hawaiian islands to choose from, including Maui, Kauai, Oahu, Lanai, and Molokai. If you’d like, you can even say your vows at one of Hawaii’s famous volcanoes. Festive Polynesian luaus and feasts are great ways to celebrate when you’re not relaxing on the gorgeous beaches. The Bahamas is another destination that’s easy. Nassau and Paradise Island are just two of the more popular places for weddings. There are sprawling all-inclusive resorts right on the beach; consequently you’ll be well looked after. The Bahamian people are very friendly and fun, and you can enjoy an exciting nightlife and gambling. Don’t miss a colorful Junkanoo parade and dancing while you’re there. The Dominican Republic has gorgeous beaches, such as Punta Cana and La Romana. It also boasts diverse landscapes that include mountains and valleys in Puerto Plata. The Dominican Republic is a beautiful country that offers great value, and the all-inclusive resorts will make sure your stay is filled with fun activities like parasailing, snorkeling, fishing, and more. Because of all this and more, how much further do you need to look? 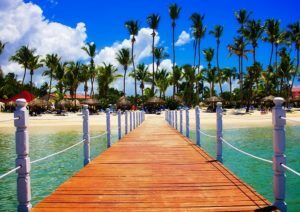 Aruba has a year-round average temperature of 27C, which makes it another great choice for couples who want to get married in the warm weather but during the winter months. There are lots of beautiful, white beaches, many different resorts to choose from, casino gambling, and excellent shopping. Lots of restaurants offer delicious fine-dining, and it’s an exotic locale far south in the Caribbean. Therefore your wedding guests are sure to also have a great holiday!